Following on from the last entry, it is now the turn of Isaac Rosenberg. I found the plaque to Isaac about 12 months ago and was prompted by writing a small piece about Anna Maria Garthwaite yesterday. I had come across Isaac before with my interest in WW1. He had also been part of an Open Learning course I had completed last year. Who was Isaac? He was a poet and artist. census was described as a Drapery Dealer and was the father of two children. Ten years later in 1901 the growing family are living on Jubilee Street, Mile End, next door to another Rosenberg family. The head of the house is of an age to be Barnet’s brother. 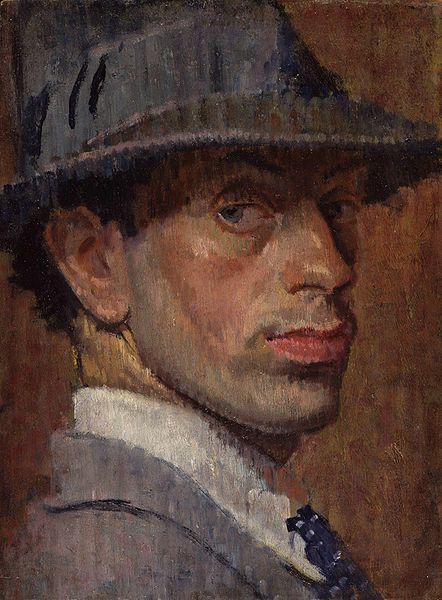 By 1911 Isaac is 20, and described as an artist. His parents have been married for 30 years and have had six children – no mention of Isaac’s twin on the census, who is mentioned in some sources. Home for the family is a four roomed house – 159 Oxford Street, Stepney. During several periods of sickness he was removed from the front lines and transferred to various duties, including delivering barbed wire to the trenches. In March of 1918, being sent to the front lines with reinforcements, he was killed while on a night patrol with ten other men. He was initially buried in a mass grave but re-interred at Bailleul Road Cemetery in 1926. Marked with his name, rank, regiment and service number, his headstone also has the Star to mark his religion, the words ‘buried near this spot’ and near the bottom ‘Artist and Poet’. Isaac’s father, Barnet was the recipient of monies owing and his War Gratuity, which was all finalised by September of 1919. His self-portraits hang in both the National Portrait Gallery and Tate Britain. 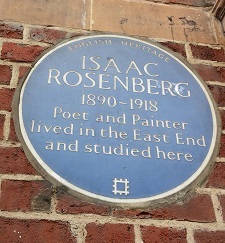 A Blue Plaque commemorates him, situated on the Whitechapel Gallery, formerly Whitechapel Library, where Isaac studied. This entry was posted in General on March 28, 2016 by carol. Anna Maria Garthwaite of Spitalfields. About two years ago my daughter and her now husband took a guided tour of the Whitechapel Bell Foundry. I was going to visit them for a long weekend, but sadly, was not able to get a space on the tour………never mind. I had my Kindle, a string of coffee shops were available. I could easily find something to do for a couple of hours. And I did! Just around the corner from the coffee shop was Brick Lane. I wondered up and down and onto the side streets. One of the streets sounded familiar, did I know why? No, then it struck me, Hanbury Street, was made famous in the 1880’s by the Whitechapel Murders………..Jack the Ripper. I saw Spitalfields Market and the beautiful Spitalfields Church. Time was passing by and I needed to retrace my steps back to Whitechapel Bell Foundry, But, I was held up just a little by a Blue Plaque on a house. I had seen quite a few plaques, but this one caught my attention and drew me close. As I walked up to the house two men were chatting. As I drew close, they parted and let me pass on the narrow kerb ‘thank you gentlemen’, I said and continued. But one of them looked familiar, I later remembered who he was, but I’m not telling! But, I will tell who the plaque was to, you already know that, don’t you! I’ve been meaning to do this blog a while, and it wasn’t until I went to a History Wardrobe afternoon, when Lucy Adlington, spoke of Anna Maria, that I was prompted to make a ‘draft’ page. Who was Anna Maria? She was born in 1688, the daughter Revd. Ephraim Garthwaite, who at one time was the rector of Harston, and his wife Rejoyce. Anna moved to York, then later to the silk-weaving area of Spitalfields, London. Anna is said to have created over 1000 designs for woven silk and some of her original watercolour designs from the 1700’s are now in the keeping of the Victoria and Albert Museum. Her work is associated with the fashion at the time for floral patterns. The English design at the time was for more dainty patterns, opposed to the French silks designs of the time, with large floral designs in unrealistic colours. The Spitalfields weavers exported to Colonial America, which at the time was prohibited from trading with France. Anna’s work appear in portraits of the period and surviving skirt panels previously owned by Martha Dandridge, have been acknowledged as Anna’s work. Anna died in October of 1763 aged, and rests in Christ Church burial ground. 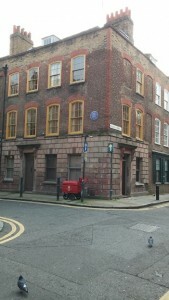 Her house at 2 Princelet Street, Spitalfields, a three story dwelling with large sash widows, has on the first floor wall the Blue Plaque that was placed there in 1998 by English Heritage. After meeting up with my daughter and her then fiance, who had by now ordered a Whitechapel Bell in the note of G, to ring at their wedding later in the year, we walked back to the car, but on the way we passed another Blue Plaque that caught my attention because of the dates moulded on the plaque for all to see, well for all to see who care to take their eyes up and look around. So, that looks like the next blog is about that plaque! This entry was posted in General on March 27, 2016 by carol. The Somme Remembered – during the month of July 100 years ago many servicemen, nurses and aid-workers lost their lives. 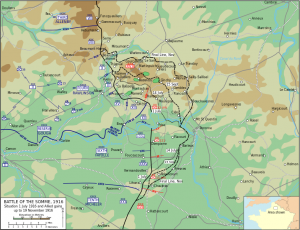 The First Day of the Battle of The Somme saw Commonwealth countries and the allies suffer over 650,000 being killed or wounded, while Germany had approximately 450,000 killed or wounded. Such huge numbers for one day – imagine taking the populations of Liverpool and Edinburgh off the face of the earth! What can Wakefield Family History Sharing do to mark this month? The month of July will feature 31 casualties – servicemen, nurses, aid-workers who lost their lives in that month during World War 1. 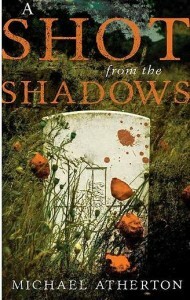 Did one of your family, or someone you know of die in July 1916? Let Wakefield Family History Sharing know and their life and times could be featured in our The Somme Remembered month. This entry was posted in General, News on March 18, 2016 by carol. George Arthur Lister. He seems to have been born around 1879 in Wakefield, the son of Edward Lister. Edward earned his living as a prison warder and in the 1901 census he was with his wife Emily, sons Alfred, George A and Frederick along with Henry Taylor their grandson. Home was 4 Silcoates Street. George at the time was 21 years old and employed as a postman. By the time 1911 came around, George had married Mary Elizabeth, who had been transcribed as Amy Elizabeth by Ancestry. The couple were living at 4 Amery Cottage, George Street, Sandal. George and Mary, who came from Thorne, had been married 5 years ad had one child, five year old Edward. George now gave his occupation as tramway motor-man for the Electric Light Railway. George had married Mary Elizabeth Yates on the 14th of August 1905 according to his service records with two children being named – Edward born on 24th of February 1906 in Wakefield and Dorothy born on the 4th of June 1914, also in Wakefield. The couple according to the military paperwork seem to have married in Bolton, but Freebmd have a marriage for the Doncaster area, which ties in with Mary being from Thorne. Twelve months after the census of 1911, on the 19th of March 1912, George attested to the K.O.Y.L.I. Territorial Force (duplicate copy), giving his address as 4 George Street, Sandal (transcribed by Ancestry as Landal). His service number became 1569 and his Medal Card tells he became a corporal on the 27th of March 1913. His service records tell that he had done annual training, gained promotion to sergeant and during time in France performed the duties of C.S.M. in 1917. He was sent to France in April of 1915, coming home in December of the same year. But, by the summer of 1916 he was back in France. A description of George brings him to life – he was tall for a man of the time being 6′ tall. He had a 39″ fully expanded chest, with good physical development and vision. The original Attestation form confirms his address and occupation found earlier in the 1911 census. George signed on the 12th of September 1914 to serve in any place outside the United Kingdom in the event of a National emergency. By 1917, George had been transferred to the Loyal North Lancs. Regt., changing his service number to 27281. It seems that somewhere along the line Mary Elizabeth moved from number 4 George Street, Sandal to number 7. Going through the service records it appears that ion 24th December 1915, George was admitted to hospital. Then being sent to England via a hospital ship – could this be the reason he was home, returning to France in the summer of 1916? Shortly after returning to France, on the 21st of July 1916, his rank of Sergeant was confirmed. He was granted leave to the U.K. on 22nd of March for one week. 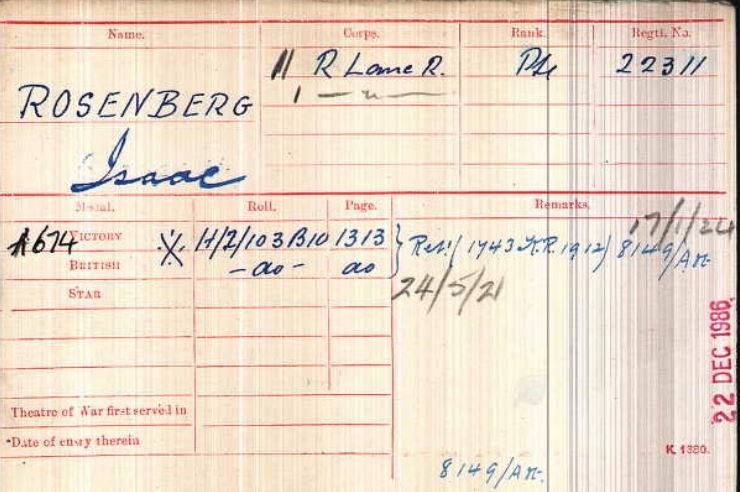 On the 22nd of June, George was evacuated to a field ambulance and rejoined the regiment the next day. By the 12th of July 1917 he was wounded on duty, but later on that month, the 31st, he was killed on duty. 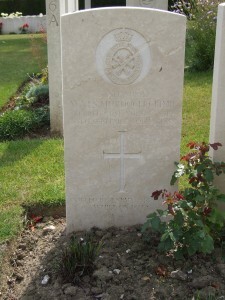 He rests in Voormezeele Enclosure No 3, grave XV C 10, along with over 1000 other casualties of war. Sandal Sergeant’s Death – Killed by a Sniper. Another Sandal man has given his live for his King and Country. We refer to Sergt. George Arthur Lister, of the Loyal North Lancashire Regiment, who lived at 7, George Street, Sandal. Sergt. Lister, who was well known in the Sandal district, was an old Territorial, being mobilised at the outbreak of war. He was previous to the war a tram-car driver in the employ of the West Riding (Yorkshire) Electric Tramways company. He leaves a widow and two children. A man who seems to have been well respected in his community and by those who fought by his side. This entry was posted in General on March 13, 2016 by carol. GenealogyInTime Magazine have compiled a Top 100 for genealogy websites. The fifth in the series of top 100 genealogy websites, includes many names we are familiar with, including Ancestry (various countries); Find My Past.co.uk; Rootschat; Forces War Records; Scotland’s People and Family Tree Maker to name just a few. Also included are lesser known sites from Poland; USA; Canada; Norway; Germany, Ukraine and Spain. The list, a very informative list gives the name of the site. What the site relates to for example, records, family trees, DNA, newspapers or search engines. The list gives the name of the country that records relate to and if they are free or a fee is chargeable. Last years ranking is also included, but most important is the URL or website address with a link direct to the site. Follow the links below to have a look at the list – you may find something new! This entry was posted in News on March 13, 2016 by carol. At a craft fair in 2014 I met Mike, who had a stand to promote his recently published book, The Long Shot. As I have an interest in anything related to World War 1, especially the people who went to war, I bought a copy and Mike was kind enough to sign my copy. The ‘Long Shot’ is set in WW1. jack Adams and Jim Cunningham are friends and work as gamekeepers on an estate in Derbyshire. One a natural shot the other with an intuitive gift for observation. 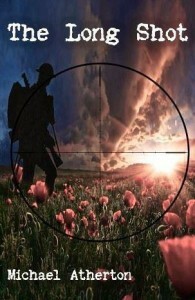 The Great War has already started when a chance meeting with a serving officer on leave introduces them to a new kind of warfare, sniping. The Germans are already experts in this deadly game of marksmanship and the British are losing men at an alarming rate, something needs to be done urgently. Working as a team in the battlefields of France and Belgium the two men quickly make a name for themselves. Jack becomes notorious, or heroic depending on which side you are on. He is a wanted man, dead or alive. Circumstances and events lead Jack to be the hunted rather than the hunter and the man charged with hunting him is an older, and wiser German sniper named Albert, he too has a bounty on his head but this time by the British. I found the book a thoroughly enjoyable read, as I was taken back to 1913 in Derbyshire, then later to the 1st of July 1916 and beyond. Well done, Mike… when is the next one coming out? The last question I can now answer, and the answer is, this month, March 2016. A Shot from the Shadows‘ see’s Albert Hagerman caught up in the dark world of political uncertainty in a demoralised and beaten Germany. The Nazi party is in its infancy but it already shows signs of being a ruthless and murderous organisation. In London people are noticing that the path to conflict is looking like it might become a highway for the great nations of Europe to be dragged into another war. If it is to be avoided they must convince the main party, the Nazi party to toe the line. To do this they have to convince its leader Adolf Hitler, and get him to see sense. Jack Adams and Albert Hagerman are sent to collect him from the heartland of this new Nazi party. Nobody expect it to be easy but the rewards are too important to leave any stone unturned, and any action to ensure the meeting take places is authorised. In a modern day France an old Commonwealth War Grave collapses into a previously unknown bunker. What the recovery team discover causes a ripple in the modern day. Looking forward to another good read! Follow the book title links to go to Mike’s shop and get hold of copies of his books. This entry was posted in News on March 10, 2016 by carol. Wakefield Express 28 August 1917 – Mr and Mrs Walter Wilkinson, Council Buildings, Flockton, have received information from the War Office that their eldest son, Private Albert Wilkinson, R.A.M.C., is missing, and believed to be a prisoner of war. Private Wilkinson enlisted on October 11th, 1915, and went out on January 1st, 1916. He had had no leave since he joined. Prior to enlisting he worked at the Emley Moor Collieries. In a letter to Mrs Allen Marsden, Flockton, Private G C Clark, of Fitzwilliam, writes and says he was a particular pal of Private Wilkinson, and he has been missing since July 10th. In describing the battle Pvte Clark said it was ‘hell on earth’. and everyone who got away was very lucky indeed. The opinion of all after the battle was that very few missing would be alive. anyhow he hoped his pal was a prisoner of war. Walter and his wife Ann, were living at The Green, Flockton in 1901. Walter, a coal miner, was a Flockton man and his wife Ann, was from near by Grange Moor. 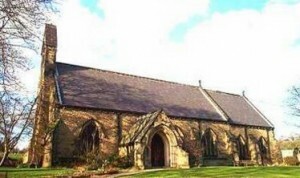 Walter and Ann Hinchcliffe married on the 25th of November 1893 at St James’s Church, Flockton. Their family consisted of Mary, Edith, Albert and Annie E., and with the aid of the census, it seems that Albert was born c.1897. Ten years later, in 1911, the family had grown a little – Mary, Edith, Annie, Albert Freddie, Maggie and Willie. The census has been amended a few times as whoever wrote the information used girl and boy instead of daughter and son. Walter was now a night labourer, amended to Lamp Man (Colliery). Albert now aged 14 was a Trammer mine, with the addition of Below Ground, Coal Mine. His two older siblings, both girls, worked in a worsted factory. Home for the family of 9 was a five roomed house at Oaker Hill, Flockton. 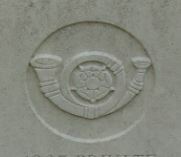 The information from the small newspaper article tells his regiment and his rank. Now comes the important question. Did Albert come home to his family alive or was he one of the many who remain in a foreign land? A search of service records and pension records came up with entries that gave no confirmation that the records were for Albert. The Commonwealth War Graves Commission lists, again gave no clue in the additional information, as to parentage or home town. As yet the service number for Albert is unknown, but a look at the Medal Card Index, gives two Albert Wilkinsons in the R.A.M.C. – not bad odds! 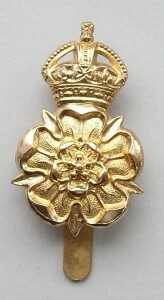 On opening one the rank is Corporal, while the other is for a Private Albert Wilkinson. It is known that he was in a battle, so the Medal Card for Private, 69666, Albert Wilkinson, with the addition of a SWB (Silver War Badge), could be a winner! Albert Wilkinson, Silver War Badge number B339193. Albert enlisted on the 11th October 11915 and was discharged on the 28th of March 1919 after being sick for a time. The document also confirms that Albert served abroad. It looks like the important question can now be answered, YES, he did survive, and survive he did so until the 1970’s. As to whether or not Albert was a prisoner of war, I don’t know………..but if you do, please let me know. This entry was posted in General on March 10, 2016 by carol. Another extract from the Wakefield Express this time for the 13th of April 1918. A few young men are mentioned under this heading. Who are they? Wounded Soldiers – The following are among the soldiers who have been wounded in the recent fighting:- Pvte Wray Blythe, New Scarboro’, Netherton; Pvte Frank Earnshaw, son of Cr. and Mrs Reuben Earnshaw (Midgley), who is in a Brighton hospital suffering from shrapnel wounds in the knee and calf of the leg; Pvte W Frost, Sandy Lane, Middlestown, severely wounded in the shoulder; Pvte Cecil Marsden, Middlestown, reported wounded in last week’s “Express” is suffering from a shrapnel wound in the head. Working through the article, it seems that Pvte Wray Blythe comes first. Who was he before he went to war and did he come home to his family after the war? 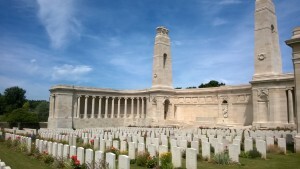 A quick look at the CWGC and the answer to the last questions seems to be a ‘yes’. But I will leave that answer with another question mark and return to that one later! The Ancestry website has no entry for a Wray Blythe. There are however, a few entries listed that are close. One entry in the military section is for a Ray Blythe of the 1/4th Y.L.I., service number 205564 – could this be our man? Taking a look at Ray’s medal card, this confirms his rank as that of Private and shows his award of two medals. On to the census. The 1901 has an entry for Ray Blythe born in 1889 in North Newbald, son of George and Mary Jane. George worked as a grocer and Ray was the youngest of the family aged 12. It appears that the newspaper incorrectly spelt Ray’s name, as according to the Freebmd site, there is a Ray Blythe born in the December Quarter of 1888 in the Beverley Registration District. It just so happens that North Newbald falls within the Beverley area. It looks like Wray is Ray! The newspaper has Wray wounded, but……..there are various entries for Pvte 205564. One being in the Soldiers’ Effects, and you know what that means! Roy Blythe was Killed in Action in France on the 2nd of November 1918 and all his effects were to go to Mrs. Elizabeth A Heppleston. Now another question arises………….who was Elizabeth? 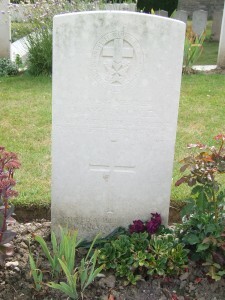 If this is the correct Wray or Ray, he is remembered on the Vis-en-Artois Memorial with nearly 10,000 other casualties, which answers the earlier question about whether he came home or not. Who is next? Pvte Frank Earnshaw. There is no mistaking this soldier as his father is mentioned in the newspaper. Frank is also a member of the local timber merchant family, that is still trading today. In 1911 Reuben and his wife Eliza were living in Midgley with four children (two had died prior to the census). Reuben was aged 39 and had been married 14 years. Frank was the eldest of the children. Queen’s Own Yorkshire Dragoons cap badge – source unknown. Frank was born in 1898 and attested on the 21st September 1916 at Doncaster, joining the Queen’s Own Yorkshire Dragoons as Pvte 4234 . He stated he was 18 years old, was living in Midgley, and was a Pupil of County A**l*st (?). Frank was 5′ 5″ tall wit a 34″ chest. 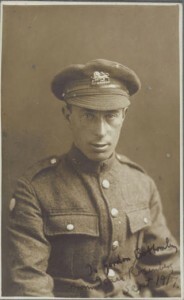 His service record tells that he served in the UK from enlistment to September 1917 when he was sent to France. 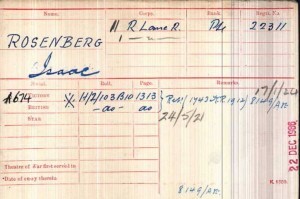 About six months later, as we know he was wounded, his records give the date of his injury as the 21st of March 1918. 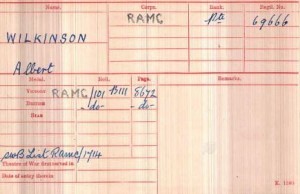 After various postings he was transferred to the Lancashire Fusiliers and his service number became 52461. After other postings at home and in France in May of 1919 he appears to be in the Balkans and November of the same year he seems to be back home. Turning the page of his service records another enlistment page is revealed and know Frank’s occupation is clear – Pupil County Analyst – well I was close! Further pages reveal that on 2nd December 1919 Frank was a Class Z, Private. Frank Earnshaw left the army in November 1919, and his Dispersal Certificate gives his address as Thrushnest, Midgley, Wakefield and that he would be proceeding to Horbury Railway Station after dispersal. The certificate lists quite a few articles of equipment and Frank seems to have mislaid a few. He was in possession of:- Rifle, complete equipment according to unit, entrenching implements, great coat, Army Book 64 and he signed to say that if he lost any of the items in the list he would be charged. Frank seems to have lost his steel helmet somewhere…………I wonder if he was charged? Other information on the certificate duplicates things already known about him, but his occupation is now given as Chemist and his Medical Category is A. He must have had a good recovery from the shrapnel wounds to his leg. Frank was also given a Protection Certificate and Certificate of Identity – basically, saying that he had served but was not remaining with the Colours. It is a change to find someone who survived the war and came home to his family. Did he marry and start his own family, I don’t know, but there is an entry for a marriage in 1924 to a Martha Earnshaw – could this be a cousin? Is it our Frank? There is a death entry for 1957 for a 58 year old Frank Earnshaw. The years and ages fit……..you tell me. Now it’s the turn of Pvte. W Frost of Middlestown, who seems to be a little left out when it comes to information. A number of men with the initial W appear in military records and census but no information that could say ‘yes, this is the one’. Finally, Pvte. Cecil Marsden. There are four men by this name. Two I have disregarded by birth year and the other one simply by where he was living. That leaves Cecil Marsden born around 1891 in Flockton the son of Henry and Jane, who in 1911 were living in Middlestown. Henry was a colliery deputy and Henry, the eldest child of three was an apprentice plumber. Frank was 20, his sister Florence was 18 and brother Maurice was 1 – their parents being married 21 years and having 3 children and none dying. I have a theory for that one but will keep quiet! On the 13th of April 1914, Henry Marsden and his family set off for the Wesleyan Chapel, Wesley Street, Ossett to witness the marriage of Cecil and Eleanor Clarkson. Cecil was living at Glen View, Old Road, Middlestown, while Eleanor was living at 13 Little Town End, Ossett. There is a Medal Card for a Cecil Marsden, which gives the Victory and British Medals for service in the Y & L R (Yorks and Lancs Regiment), Pvte 202794, but also tells that Cecil received a SWB (Silver War Badge). We know that Cecil had received a shrapnel wound to the head and was therefore eligible for the SWB. 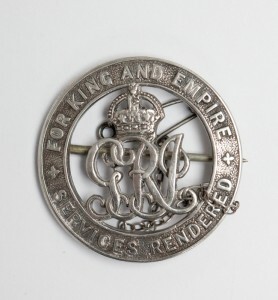 The Silver War Badge Records for Cecil tell that by now he was a Corporal and serving in the 4th Battalion from which he would be discharged. He enlisted on the 13th of Marsh 1916 and was discharged on the 9th of November 1919 due to sickness aged 22 – there seems to be a bit of a miss match in ages as on his marriage certificate he is in his 20’s, years later he is still only 22! Which age is correct? His year of birth plus the 22 years of age on his SWB papers does not give 1920, but the entry below for a man aged 31 is nearer as he was 23 when he married. This entry was posted in General on March 6, 2016 by carol. The FFHS (Federation of Family History Societies) had issued ‘Our Really Useful Information Leaflet‘ and it is packed with useful hints, tips and over 180 societies that cover the length and breadth of the UK and worldwide. The on-line leaflet also has a long list of interesting and useful websites that could help with your research, add background information or just be of interest and be worth a visit. If your family is from Britain or the Commonwealth? Were they a clergyman? Did they work on the railway or were they part of the military? Did they go to America, Canada or Australia? Or did they appear at the Old Bailey? Whatever they did or where they went during their lifetime you will find a website listed on this leaflet that will certainly be of help and aid your research. The 2016 leaflet has an informative section starting on page 16, focusing on Quarter Session Records in England and Wales – what a treasure trove of information is held within those records. The records themselves survive in some counties from the 15th century and go up to 1972 when they were replaced by Crown Courts. What can be found in the Quarter Sessions? Crimes and felonies, Bastardy Orders (they can be very interesting), Settlements (who was moved from one parish to another and why), Apprenticeship Indentures, Matrimonial matters, Militia and much more. If you are starting out in your research or have been researching for many years you will be sure to find something of help and interest within the 20 pages. The Federation also publish ‘Our Australasian Really Useful Information Leaflet’, again packed with information relating to the area. If you have family in Australia or New Zealand, it is worth having a browse. The Federation’s newsletter, published six times a year is also packed with useful information and links – follow the link to subscribe. This entry was posted in News on March 3, 2016 by carol. Daisy rests in Longuenesse Commonwealth War Graves cemetery, just outside St Omer, northern France, along with soldiers of various nations, non-combatants and non-war burials. Daisy Kathleen Mary Coles was born in Scotland, the daughter of Mr and Mrs Walter Coles of Priorsford House, Peebles. In September of 1914, Daisy, of 18 St Ninians Terrace, Edinburgh, joined the Voluntary Aid Detachment and worked at the 2nd Scottish General Hospital. 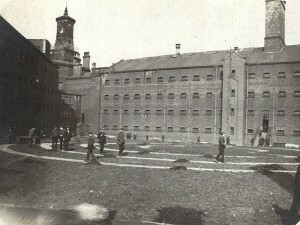 Originally, Craig Leith Poorhouse, the 2nd Scottish General Hospital had 1032 beds. In 1917 the hospital sent a detachment to St Omer as the 58 (Scottish) General Hospital. It was here on the 30th of September 1917 that Daisy lost her life while on duty. 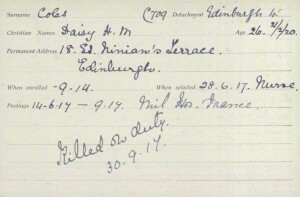 The Red Cross record card for Daisy has her listed as Daisy H M Coles, but her date of death matches the CWGC record and her headstone. Her age, also differs on the card by two years. Daisy’s character and work were noted as being very good. She was also Mentioned in Despatches. The headstone that marks her resting place has the usual information, name, date of death, age and service, but at the base the words ‘killed by enemy action while on duty’. A few years after the war had ended her local church, Christ Church, Morningside, Edinburgh, unveiled their war memorial. The Scotsman of Wednesday, 2nd of November 1921 recalls the occasion. CHRIST CHURCH, MORNINGSIDE, EDINBURGH – The war memorial, in the form of a bronze tablet, which has been placed in the east wall of the north transept. “To the honoured memory of those from Christ Church, Morningside, who gave their lives in defence of truth and freedom in the Great War, 1914-1919,” was unveiled yesterday, All Saints Day, by Mr James M. Watt, and dedicated by Bishop Walpole. The anthem sung by the choir immediately after the dedication of the memorial was “Blest are the departed,” by Spohr. The bishop preached the sermon. Twenty-five members of the congregation, including Miss Daisy K. M. Coles, who was killed in a bombing raid on the hospital where she was nursing in France, perished in the war. A bugler of the 1st Battalion The Highland Light Infantry, at the conclusion of the service, sounded the “Last Post” and the “Reveille.” The Bishop was assisted by the Rector, the Rev, Eric H, Brereton, O.B.E., Hon. Chaplain to the Forces, 3rd Class. The extract from the war diary (below) tells what happened on the night of the 30th of September 1917 and that three nurses were killed. Dairy was one of those, the others were Elizabeth Thomson, the other was Staff Nurse Agnes Murdoch Climie. Elizabeth Thomson, volunteered in 1917 as a nurse, and gave her contact details as c/o R Thomson, Esq., St John Street, Creetown Kirkcudbright and like Daisy, she was also Mentioned in Despatches. Agnes Murdoch Climie’s time in the war differed from that of Daisy and Elizabeth, as she was a professional nurse. From the War Diary of 58th (Scottish) General Hospital, St Omer tells the story of that fateful night. 1/10/17 During a hostile air raid on the night of 30/9/17 – 1/10/17, three bombs were dropped in the camp at 10.40 pm, ( 2 on Marquees for patients and 1 in the nurses compound). Of the 2 bombs which dropped on the marquees, 1 struck a marquee which was, fortunately unoccupied, the other struck a marquee occupied by patients and 2 nurses, who were on duty. The bomb which fell in the nurses compound struck a bell tent, which was unoccupied as the 2 nurses who sleep in the tent were on night duty. The casualties which have resulted are :- Nurses killed 3, wounded 3 ( 1 dangerously). Other ranks :- killed 16, wounded 60. Total killed 19, wounded 63. Of the other ranks wounded, 14 were transferred to other hospitals and one of these has since died. There has been much damage to canvas and equipment. 54 marquees (hospital, large) have been damaged (2 have been absolutely demolished, while the damage to the others varies from almost complete destruction to mere riddling). 21 bell tents have been damaged ( 1 was completely destroyed by a bomb and 20 have been riddled). Many pieces of iron pierced the new corrugated iron sleeping hut for sisters. 1 piece pierced iron and 3 pieces of asbestos boarding. Numerous panes of glass have been broken in the permanent buildings. One of the ablution houses has been damaged. Surgeon General MacPherson, the ADMS and the Matron in Chief called today and it was arranged for the transfer of all lying cases to other hospitals so that at night the walking cases left in hospital might go to the cave in the public garden and sleep there. In the evening patients and unit moved to the cave in the public garden and only the police and a few orderlies were left in the camp. The 3 wounded nurses were transferred today to No 10 Stationary Hospital. 2/10/17 The 3 nurses (Sister Climie, Nurse Thompson and Nurse Coles) and the 16 other ranks killed by hostile aircraft on the night of 30/9/17-1/10/17 were buried today at 4:00 pm in the Souvenir Cemetery Longuenesse. Sister Milne, who was dangerously injured in the same air-raid died last night in No 10 Stationary Hospital. 2 other ranks who were wounded have died today, so that the statistics as a result of the raid are, to date :- Dead, nurses 4, other ranks 18. Wounded :- nurses 2, other ranks 58. Totals Dead 22, Wounded 60. Staff Nurse Agnes Murdoch Climie was from Newlands, Glasgow. VAD Daisy Kathleen Mary Coles was from Peebles/Edinburgh. Sister Mabel Lee Milne – location unknown. Mabel is named on the Perth Academy Memorial. The graves of Staff Nurse Agnes Murdoch Climie and Sister Mabel Lee Milne of the Territorial Force Nursing Service, as well as Daisy Kathleen Mary Coles and Elizabeth Thomson of the Voluntary Aid Detachments, killed by enemy aircraft 30th September 1917, erected by officers and nursing staff of the No. 4 Stationary Hospital [or the 58th (Scottish) General Hospital] at Longuenesse in Gouvenir Cemetery. This entry was posted in General on March 3, 2016 by carol.